Some might debate the start of summer being the actual solstice or the arrival of Memorial Day. I'll add to that questionable launching point: the first patio night at the Grotto. Admittedly, I have not been there for months. We, as a couple, have not been there for even longer than that. And don't even ask when my man-date, Scott, and I have been there last. Eons. Angela, our normal waitress, gave us a very very hard time for not seeing her for months on end, but she allowed us to sit in her section and she was nice about it all - but still kept laying on the guilt. Or trying to. She's not my mother, so it doesn't work that well. 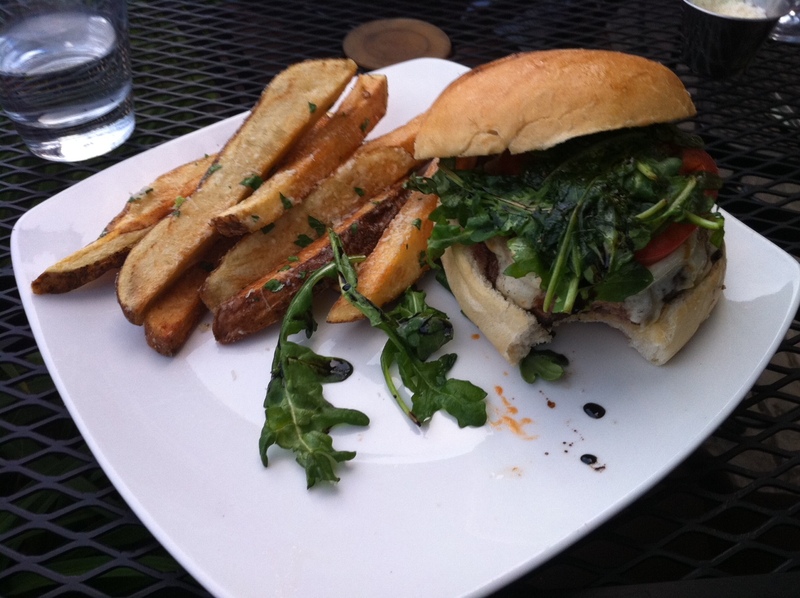 A bottle of wine, a salad and my Grotto burger (oooh, Copicola, smoked mozzarella, tomatoes, arugula, olive oil & balsamic reduction) and good conversation. While I have seen Denton most nights this week, we haven't really talked. Some times work just has our down time being just that - dinner, some tv and sleep. So it was nice to just casually talk, people watch and drink....oh and eat. In my world, summer has now begun. Great place to usher in summer! Good water is the next priority. That sounds like a splendid way to start the summer.